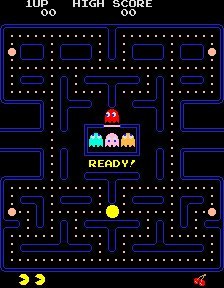 With his trademark piechart head and onomatopoeic “paku paku ” chomp, Pac-Man  looms large in the history of the modern video game. No other game character can be said to have captured the world's attention so thoroughly and transformed the game industry so profoundly. Born out of Japan's burgeoning game industry of the early 1980s, Pac-Man has outlived many of its contemporaries and remains popular even today . For most people however, including many in Japan, the reminder of Pac-Man's 30 year birthday came not from its maker but from Google, who commemorated the event by inserting the game into its own logo . Many Japanese were pleasantly surprised to stumble into the character, one of their country's most famous cultural exports, in its new online setting. On Twitter in Japanese, people tagged comments on Google's java-based game with the hashtag #googlepacman_jp . When I was in high-school, I used to play Pac-Man like crazy on the PC-6001MkII [personal computer ]. They've ported it really well. The bug is in fact a “kill screen ” from the original version of the game, meaning that the Google version — with its colorful 256th level — is in fact true to the original after all. If the novelty of the new Pac-Man game and its mysterious 256th level were not enough to entice you to give it a try, consider that the game can also be played in 2-player mode . Catch it will it lasts!